Workers at Porsche's plant in Stuttgart, Germany, will work shorter 34-hour weeks by mid-2013, while producing the same number of vehicles. FRANKFURT (Bloomberg) -- Porsche moved to shore up its industry-leading profit margins by cutting the number of labor hours required to produce a vehicle. 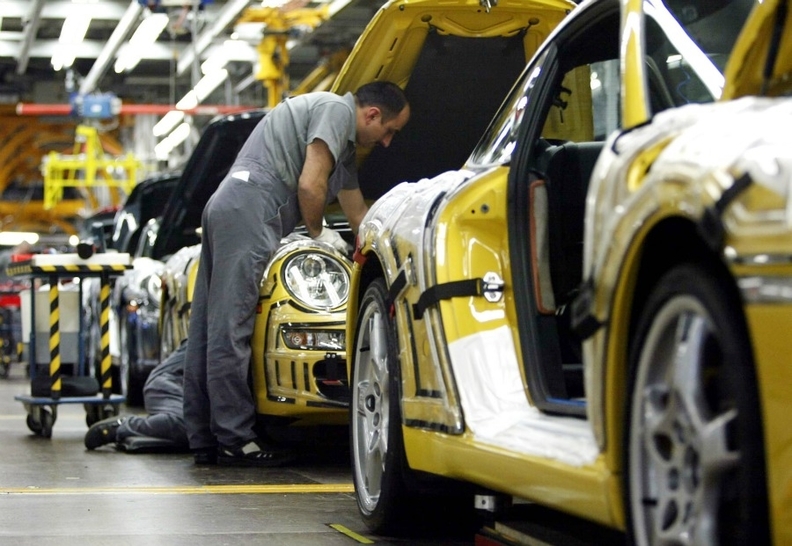 The 3,300 workers at its car plant in the Zuffenhausen district of Stuttgart, Germany, will work 34-hour weeks by mid-2013, an hour less than at present, while producing the same number of vehicles, Porsche said in a statement. The measures are also intended to attract prospective employees. "It is a win-win situation," CEO Matthias Mueller said at a press conference at Porsche's headquarters in Stuttgart. "The employees benefit from it, and the company does too." New models including the Macan compact SUV and an updated version of the Cayman sports car are part of Porsche's strategy of selling 200,000 vehicles a year by 2018, a 71 percent gain from 2011. The division's nine-month operating profit totaled 389 million euros ($508 million) on revenue of 2.17 billion euros, giving it a margin of 18 percent. That compares to BMW's automotive margin of 9.4 percent and the VW brand's 3.6 percent. Engineers at Porsche's research and development center in Weissach, Germany, will now be able to work as few as 40 hours a week, and working times can be adapted to individual needs, Thomas Edig, the company's personnel chief, said at the press conference. "These operational agreements will lead to a great improvement in Porsche's flexibility," Edig said. "We are increasing our profitability. The board is convinced that, with this agreement, we will be as prepared as possible for the market environment of the future." Uwe Hueck, head of Porsche's works council said that productivity at the carmaker is likely to be boosted by the agreement, which is valid through 2016. While luxury carmakers such as Porsche, BMW and Mercedes-Benz have resisted a plunge in sales that has burdened mass-market companies such as Fiat, PSA/Peugeot-Citroen and Renault, Porsche said in September it was planning to build fewer than the 155,000 vehicles initially planned for this year. The brand still plans to produce more than last year, with 140,000 vehicles set to roll out of its factories in 2012. Volkswagen Group's acquisition of Porsche was completed in August when VW paid 4.5 billion euros for the 50.1 percent stake it didn't already own.